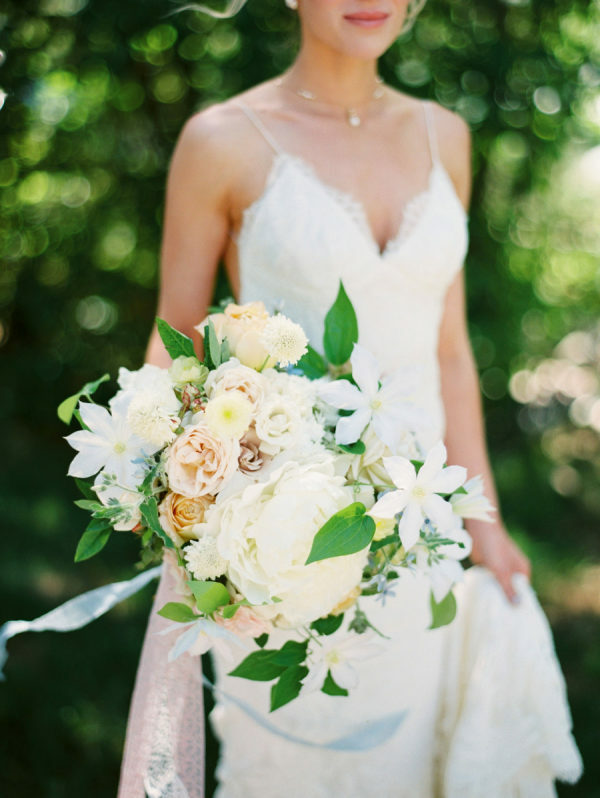 If you thought this wedding was a stunna, just wait until you see the blooms that built out the Bride’s breathtakingly beautiful bouquet a la Beargrass Gardens Florals And Events. It’s the type of pretty that’ll have you putting your Saturday on pause and thankfully we’ve got it all waiting for you below! From Beargrass Gardens Florals And Events…My main objective when crafting this bouquet was to design something fresh, playful and to sing of the beginnings of Summer. The wonderful thing about a client such as our Bride Danielle, was that she trusted me completely. She did not necessary want a loose and flowing bouquet with alot of greenery, yet something with movement and texture. That is really all she asked of me in regards to her bouquet. Therefore, I elevated clematis above all other flowers, in which I layered, and kept much of the foliage on each stem. Also, because Danielle’s eyes are a beautiful light blue, I wanted to use hints of the same color to highlight her amazing feature. I used pale blue tweedia and silk ribbon that matched her eyes perfectly. Press Play For More Floral Inspiration! Make Wedding Arrangements Easier With This Advice! Great Ideas To Make Your Wedding Shine!